In February 2017, Hasbro released the 6" Marvel Legends: Guardians of the Galaxy Wave 1. One of the figures was Sam Alexander Nova. 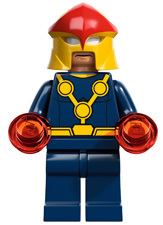 The package also came with the torso of the Build-A-Figure character for the Guardians set - former Black Nova Titus. Along with the Titus BAF torso, the package included Black Nova Phlish! In 2015, WizKids released the Marvel Heroclix Avengers Assemble set which featured 2 Nova-related HeroClix. The set included Richard Rider Nova (#039) and Steve Rogers Nova Prime (#061). The set also included a set of Avenger ID cards. 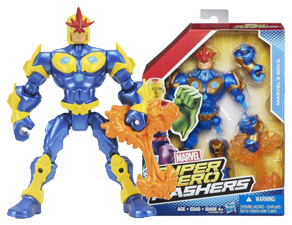 In August of 2015, Hasbro released the 2015 Marvel Mashers wave. Along with Carnage, Ant-Man, Venom and Rocket Raccoon was a Nova figure. The figure measured 6 inches tall and came with an energy blast snap-on attachment. The figures can combine with other hero figures. Some figures came with parts of other heroes so buyers could combine them into new characters. For example, the packaging for Drax contained parts of the Nova figure. In July 2014, Hasbro released a new line of action figures based on the Guardians of the Galaxy movie released on August 1, 2014. 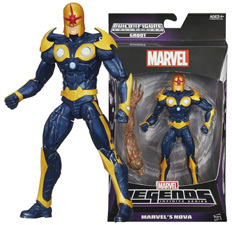 One of the figures in the Marvel Legends: Infinite Series was Nova. The action figure measured 6 inches in scale and came with one of the Build-A-Figure parts for Groot. In August 2013, Diamond Select Toys released the Sam Alexander Nova minimate. The 2 inch figure was part of Marvel Minimates Series 51. The Centurion was part of different two packs which contained Sam Alexander Nova and either Carnage, Superior Spider-Man or Venom. The figure also came with an alternate helmet. In August 2013, Diamond Select Toys released the Nova Corps Centurion minimate. The 2 inch figure was part of Marvel Minimates Series 50. The Centurion was part of 2 two packs which contained Nova Corps Centurion and either Baron Zemo I or Baron Zemo II. The figure also came with an alternate head and multiple hairpieces. 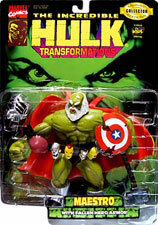 In late January 2013, Hasbro released Series 4 in their Marvel Universe set of action figures. One of the figures in the set was Nova. The figure measured 3.75 inches. The Nova figure came with a collectible comic shot. 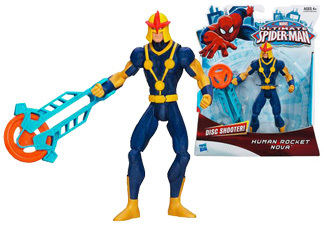 In late January 2013, Hasbro released a new line of action figures based on the Ultimate Spider-Man TV show. One of the figures to be released in the first wave was be Nova. The action figure measured 6 inches in scale and came with a detachable disc shooter. In January 2013, Hasbro released a playset based on the Ultimate Spider-Man TV show. One of the figures in the playset was Nova. 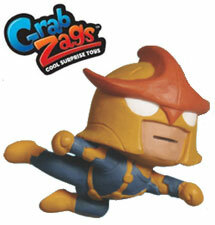 In July 2012, Zagwear released a new toy line called Grab Zags. One of their series was for the Ultimate Spider-Man based on the DisneyXD television show. In Series 1 of the USM collection was Nova. The mini-figure measured 1 3/4 inches. On April 11, 2012, WizKids released the Marvel Heroclix Galactic Guardians set which featured 8 Nova-related HeroClix. The set included Nova Prime (#001), Nova Corps Recruit (#002), Nova Corps Centurion (#015), Super Nova (#100 - Marquee), Fast Forces Nova, Gravity Feed Nova (#201), Nova Denarian (#210) and a Nova helmet (#S101). 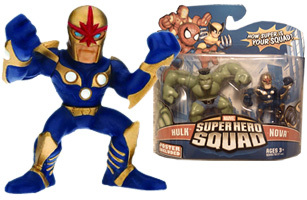 In May 2009, Hasbro announced that Nova would be a figure in the Marvel Super Hero Squad line. 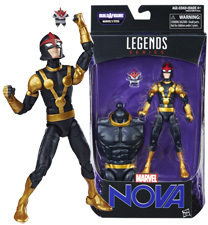 Released in August of 2009, Nova was part of Wave 15 in the series and was part of a two-pack along with the Hulk. In January 2009, Diamond Select Toys released the Nova minimate created by Art Asylum. 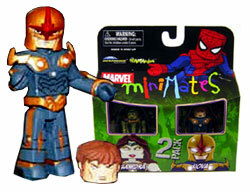 The 2 inch figure was part of Marvel Minimates Series 23. Nova was part of a two pack which contained Nova and Gamora. The Nova figure also came with a removable helmet. 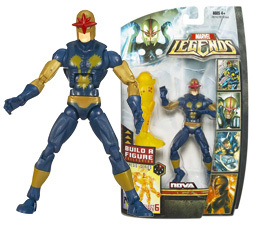 In July of 2007, Hasbro announced a Nova action figure as part of the Marvel Legends series. 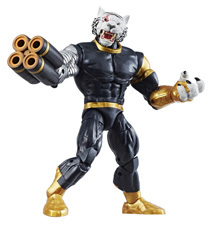 The figure was to be one of the Series 4 set (Nemesis) along with Punisher, Daredevil, Beast, Black Bolt & Tigra. Hasbro later cancelled the set before their scheduled release date of January 2008. However, in April of 2008, the retail chain Wal-Mart made an arrangement with Hasbro to carry the figures as Wal-Mart Exclusives. 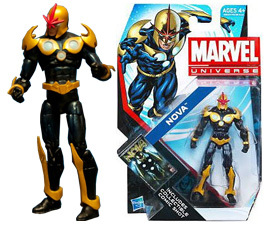 In December of 2008, the Nova action figure was released. On September 15, 2007, the British company Eaglemoss released the Nova figurine and magazine in the United Kingdom. The figurine was made of lead and hand-painted. It measured 8cm (4 inches) tall and cost Â£5.50 pound sterling ($12). The 20 page magazine that came with the figurine was a full-color history and overview of Nova. 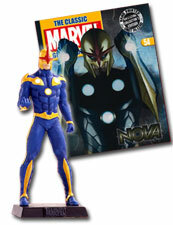 Eaglemoss released the Nova figurine and magazine in the United States on December 19, 2007. On November 15, 2006, WizKids released the Marvel Heroclix Supernova set which featured 4 Nova HeroClix. The set included Nova (Rookie - #37), Kid Nova (Experienced - #38) and Nova (Veteran - #39). 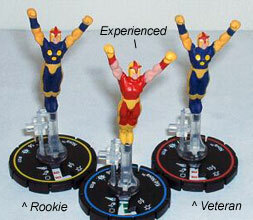 An exclusive HeroClix was also released with the set featuring Nova's enemy, SuperNova (#201). The Nova figures were sculpted by Lukas Little and painted by Chris Hart. The SuperNova figure was sculpted by Elizabeth Mars and painted by Chris Hart. 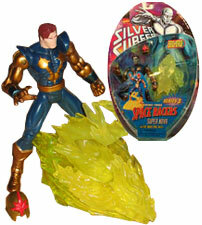 In 1998, Toy Biz produced the SuperNova action figure as part of the Silver Surfer Series III set. The set went by the name of Space Racers and the SuperNova figure was actually Rich Rider. Rich's identity was changed from Nova to SuperNova because an action figure of Galactus's herald, Nova, was already produced. The figures were released in conjunction with the Silver Surfer animated series which was running at the time. Nova's helmet appears on the belt of the Maestro (a future version of the Hulk from the Hulk: Future Imperfect mini-series). The figure was part of the Incredible Hulk Transformation series released by Toy Biz in 1996.